Pride is a virtue, when it comes to coming to common sense for a Malaysian made product. A lot of Malaysians probably look at the the right angles to agree but the louder minority, nit-pick to justify themselves otherwise. Regardless, August next year will mark Proton or its original name, Perusahan Otomobil National, of 30 years in automobile assembly and production mainly for the Malaysian market. 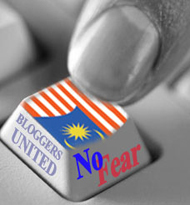 It has been an enigma of erratic bumpy ride, all the way. 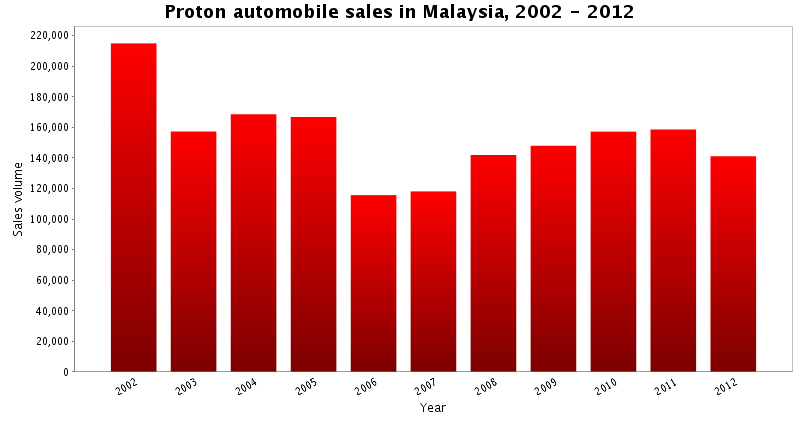 Proton sales, the past ten years. Notice the huge dip in 2006. Proton started in late 1984 with re-badging of then the Mitsubishi Lancer. That opened opportunities for Malaysian automotive part manufacturers to begin operations by supplying components to the first generation Proton Saga. As the local content increases, more opportunities are being opened. By 1987, Proton started to introduce variants to the Proton Saga with automatic transmission and later hatchback models. By then, Proton had become an automotive household name. By early 1990s, Proton is the major mark on the streets where the market share stands in the neighbourhood of 65% of new cars sold. The growth provided progression. In 1993, Proton introduced the model Wira which was a move away from the many variants of Saga. By end of the year, Proton market share is 74% of new cars sold and registered in Malaysia. In 1996, the ownership and control of Proton was handed to automotive king DRB founder Tan Sri Yahya Ahmad. He was destined to transform the Malaysian automotive industry and had big plans. By October 1996, Yahya acquired British renown design, R&D and racing car production house Lotus Ltd., as part of Proton’s strategic plan to move forward. However, it was short-lived when he was killed in a helicopter accident on 2 March 1997. His effort did not go to waste. As a matter of fact, it was carried through by his successor. Proton started its own design team and the engineers started to develop their own design. The outcome is by 2000, Proton introduced its own indigenous product Waja 1.6L. It replaced the second Mitisubishi Lancer-derived product, Proton Wira. Proton was realising the vision envisaged of Fourth Prime Minister Tun Dr. Mahathir Mohamad to take Malaysia as an industrial nation with technical and technology competency and capability. When it was exported abroad, it was well received. Even in the critical British market. Proton earned the title “Fastest growing imported car in so short of time”. The collaboration and synergy with wholly owned-subsidiary Lotus of Norwich brought a lot of goodies for Proton models, which are categorised under the compact segment. Examples are the first and second generation Satria and Satria Neo. Proton was incepted and incorporated 1983 under Heavy Industries Company (Hicom) because Tun Dr. Mahathir saw the strategic values from the ability for Malaysians to have automotive technology capability. It was a starting point for the learning curve, for an eventual capability of a fully industrialised nation and technological competency as a developed nation status. The strategy was even bigger than that. Using automotive as a starting point, Malaysia could eventually move into the design and manufacturing for defense equipments such as armoured vehicles and battle tanks. However, Tun Dr. Mahathir’s vision which started to show potential from growth, was not followed through when PM ‘Flip-Flop’ Abdullah Ahmad Badawi took over. In fact, not only the strategy of developing a full blown automotive industry capability was totally neglected, in the excuse of open-ness to global trade and doing away with protectionism policies for specific industries. An Ethos Consulting developed National Automotive Policy (NAP) was introduced where Malaysian automobile market was opened to more imports and the liberalisation began. The lame excuse was Malaysian motoring consumer deserve the bigger options of imported cars. At the same time, Proton was treated as an investment and placed and restructured under Khazanah Nasional Bhd., where then trusted Chairman Dato’ Azlan Abdullah started a process of cannibalising and eventually the beginning of slow death. Never the less, Proton manged to design and develop their own indigenous products such as the Preve and Suprima S models. Considering the amount of CAPEX which was invested for the development of these two products compared to the other in the same class, the outcome was brilliant. On merit, these two models should able to win against any other brands in Malaysia since both came into the market as ‘fully loaded’. However, there are minority within the targeted market who are bold in their criticism to these models. In 2012 Proton ownership was again reverted to DRB Hicom for a cash consideration of RM 1.2 billion. Proton under the new management was quickly synergised with marks under he DRB belt. Proton collaborated with Honda. 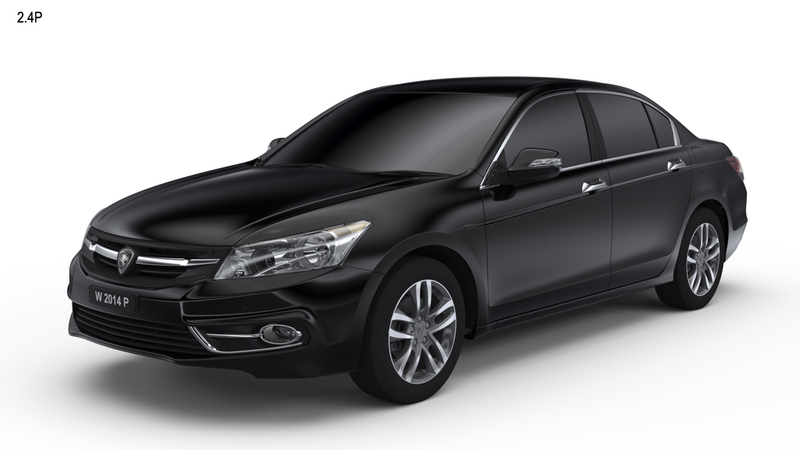 Under the pressing demand by the Malaysian Government to replace the Proton Perdana model which was introduced in 1995 based on Mitsubishi Eterna, Proton struck a deal with Honda to develop the new generation choice staff car for Ministers, Deputy Ministers, Chief Secretaries and Chief Executives of Government bodies and senior civil servants based on the 8th generation of Honda Accord. In mid-2015, Proton would introduce a Malaysian indigenous designed and produced which was developed and acquired from Petronas. 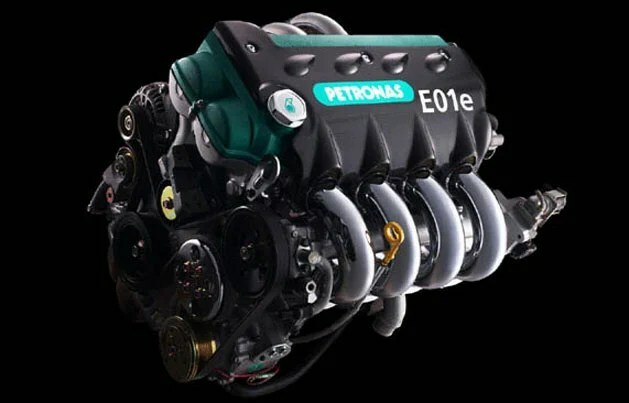 Currently, it is a 2.0L turbo-charged four in-line engine which produces 190HP and planned for the second generation Proton Perdana, which recently being introduced based on the 8th generation Honda Accord. A 1.6L and 1.8L are being planned, to power the Preve and Suprima S models. The saying of “Proof in the pudding is in the eating”. All those critics of Proton products should give the current models available in the market Saga FLV, Satria Neo, Preve and Suprima S and upcoming Perdana the fair chance based on merits due. In the exercise to rationalise the Malaysian automotive industry which include the imports via the AP system, the Federal Government introduced the National Automotive Policy (NAP) 2014 on 20 January 2014. * to promote competitive and sustainable domestic automotive industry including the national automotive companies. * to safeguard consumers’ interest by offering safer and better quality products at competitive prices. * The government is open to possibilities to reduce excise duties gradually when the fiscal situation permits. * On Approved Permits (APs), the government has decided an indepth study to be undertaken to asses the impact of the termination of Bumiputera participation in the auto industry. * A car price reduction framework has been developed to fulfil the promise of gradual reduction ranging 20 per cent to 30 per cent over the next five years. * More new national car models and variants will be introduced at competitive prices this year. * The NAP 2014 will see a bigger base of new models being introduced in the domestic market. These models will not only be greener but also safer. * The government is constantly reviewing its fiscal position and is open to possibility to reduce excise duties when the fiscal situation permits. * Models such as Saga SV, Persona SV, Viva, Alza and MyVi S Series, the new Honda Jazz and Nissan Almera were introduced at reduced prices of between three and 17 per cent. These models accounted for 30 per cent of market share in 2013. * Malaysia to become an energy-efficient vehicle (EEV) hub. This encompasses strategies and measures to strengthen the entire value chain of the automotive industry and will also lead to environment conservation, high-income job creation, transfer of technology and create new economic opportunities for local companies. * The EEV includes fuel-efficient vehicles, hybrid, electric vehicles and alternatively-fuelled vehicles. Proton is confident that the NAP 2014 would be the ‘push factor’ for the corporation and brand to do better. KUALA LUMPUR, Jan 20 — National carmaker Proton insisted today it will “survive” the greater competition from foreign vehicle producers now that the government has liberalised the auto industry to woo others into the market, under new guidelines in the revised National Automotive Policy (NAP) 2014. Tan Sri Khamil Jamil, the chairman of Proton, said the company — which critics have seen as heavily relying on the government’s past protection from competition — will grow further. “Proton will continue to survive and be stronger and better,” he told reporters today at the unveiling of the National Automotive Policy (NAP) 2014 here. He later disagreed that Proton was “for sale”, saying that the company had undertaken “structural changes” and “structural improvement”, but did not provide further details. “I believe, like what the minister has said, Proton is still very relevant together with Perodua, two national automotive companies that will play a vibrant and focal role to enhance the local automotive industry,” said Khamil, who is also the managing director of DRB-Hicom Bhd, which is the sole owner of Proton. Earlier, International Trade and Industry Minister Datuk Seri Mustapa Mohamed acknowledged that Proton has been facing stiffer competition than before as the car market becomes increasingly liberalised. Mustapa said the government did the “right thing” when it set up Proton in 1983, but noted that the country’s inking of free trade agreements with the Southeast Asian region and countries like Japan and Australia was opening up the car market. “At present, the market is becoming more and more open because of AFTA, ASEAN, cars are imported duty-free, so the market is more liberalised now,” he said. Mustapa said that MITI previously controlled car prices to protect Proton, but said it was now dictated by market forces which will result in a competitive industry. “There was a time when car companies have to come to MITI for approval to set prices, that was to protect Proton, but the policy has been dismantled in 2004,” he said. Mustapa also said Proton has undergone changes in the past few years in a bid to be more efficient and competitive. Today, Khamil touched on Proton’s plans to produce energy efficient vehicles (EEV), saying that it was already in partnership with carmaker Honda Malaysia Sdn Bhd. Honda, in which Proton owns a stake, has committed to pouring in RM 1,000 million to build hybrid cars in Malacca. Proton is also working on its own EEV model, Khamil said. “We are on track, hopefully by end of 2015, we will see some results for Proton,” he said. Even before the NAP’s unveiling today, three car companies had already agreed to invest in EEV production here — including Honda, Perodua’s RM1,300 million investment and Mazda’s RM300 million investment. Based on the NAP 2014, it is likely single largest portion of the 200,000 units of exported Malaysian made or assembled cars would come from Proton. On top of that, emphasis have been given to the development of ‘green cars’ (EEV), which Proton is deep into the development its own electrical and fuel cell models. The affordability range models, where Saga FLV and Persona SV are categorised under, are two products offered by Proton with a lot of goodies. It is not just the value of the car, with the equipment and trim but also affordability ownership programs where consumers ‘Buy now, pay later’ schemes. Proton is also the car manufacturer which opened the biggest opportunity for the participation of home grown automotive vendor development program for component and parts manufacturers. At the moment, there 360 companies serving the entire Proton supply chain. The rationalisation of the new models plus re-strategising the brand and marketing and product placement programs is part of DRB’s commitment to make Proton a success story. These are the mitigating justification part of the RM2 billion financial package offered and made available should be allocated for Proton. Under DRB-Hicom, Proton is set to maximise its production capability and optimumise all assets and resources the new roadmap laid out. That would justify even if being analysed in the context as a corporation, the criticism should be made in the right perspective and consideration taking into consideration the variance in ownership and management, through time and spectrum of current events and mitigating circumstances and environment. It is very easy and probably fashionable in some quarters to make generalisation based on perception and taking re-phrased and re-packaged sweeping pot shots. In reality, Proton came a long way through in the dynamism of a globally very competitive and challenging industry. It had been a volatile learning curve in the past thirty years and the national car project did follow through and now ready to move into the next phase, as part of a promising automotive group which has proven its steady growth and to add value. Then again to be balanced and the same time correct, is an intellectual virtue which distinguishes one’s sense of observation and analysis, differentiating from any intent to express one’s thoughts tinged with omni-lethal concoction of the mixture between mischief and malice.